Looking for work from home business ideas? If you have a hobby or a passion or an area of interest you would like to pursue further, then Site Build It (SBI) may be right for you. I chose Solo Build It to build my business because they they provided me with all the tools I needed to design and build a real business on-line in one complete package. I knew absolutely nothing about building a site before I started. 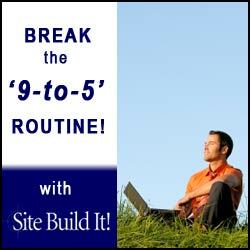 Solo Build It provided design tools and templates to get me started and of course they host this site. But they also gave me tools which allowed me to get to grips with search engine optimization market research and understanding my traffic stats. Building a business takes time of course, and Solo Build It is not a get-rich-quick scheme, far from it. But they have an Action Guide which is a 10-part plan that will take you slowly but surely from zero knowledge to running a site that actually makes money. If you are willing to work hard and follow the SBI formula you can succeed whatever your passion may be. Mine of course is photography but SBI is equally suitable for anyone who has a hobby or knowledge that they would be willing to share through well-written articles for the web. If you need inspiration, check out some of the case studies of other SBI'ers. And don't worry if you don't know how to write for the web as SBI has a free ebook course called How to Write for the Web which covers that too! Here are some more free ebooks, depending on your area of interest. Just click one (or all!) of the ebooks listed below to start reading your free course straight away - no sign up needed. If you want to print a copy and review the e-book offline, right-click to download it.